Former Edinburg Mayor Pro Tem Alfredo "Fred" Longoria, a native son, successful businessman, and longtime community leader who helped transform what many considered to be a sleepy border town in the early 1990s into a major economic force for South Texas in 2009, on Sunday, March 22, passed away as a result of complications from a stroke. He was 80. For Rep. Aaron Peña, D-Edinburg, Longoria’s passing literally hit home. His son, Aron Leonel Peña, is married to one of Longoria’s daughters, Clarissa Longoria-Peña. 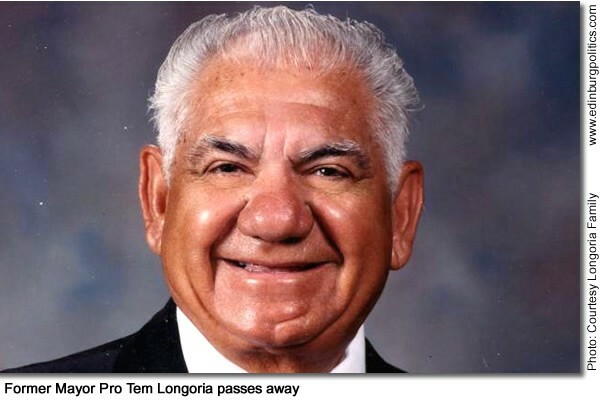 "I am very sad to hear that Fred Longoria has passed away. My condolences to his family and friends," the veteran state representative reflected. 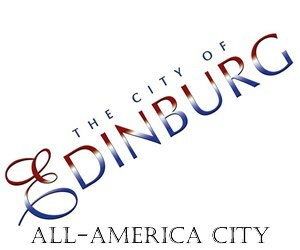 "Fred was not only a long time supporter but a good man who wanted to do right by his City of Edinburg. Sometime after our initial work together, Fred became a member of the family when my eldest son married his daughter," Peña said. "The City of Edinburg has lost a loyal son who will be dearly missed. May God speed." See story later in this posting. The Hidalgo County Commissioners’ Court on Tuesday, March 17, unanimously approved a resolution in support of a “universal freight shuttle”, featured in this diagram, along U.S. Highway 281. The diagram illustrates what the freight shuttle could look like: an elevated, unmanned track with single load transporters going in both directions. At destination, the transporters would enter cargo bays terminals at which point the trailers would simply hook up with a traditional big rig to get a short distance to a particular store. The freight shuttle is a linear motion, automated track with single container transporters that could get goods quickly and safely from Point A to Point B using only renewable energy sources and with zero-emissions. 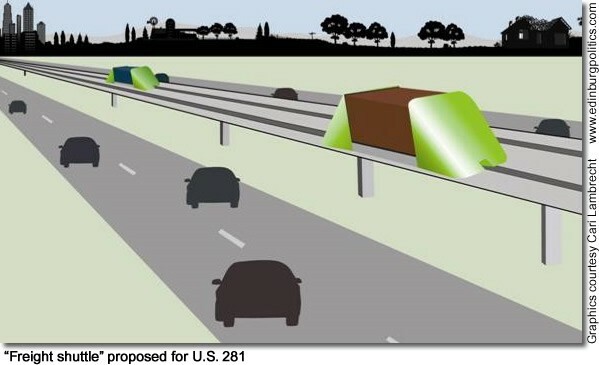 This concept, developed over the past eight years by the Texas Transportation Institute, could be used within the footprint of existing highways, including U.S. Highway 281. 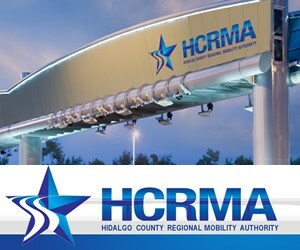 “Hidalgo County is working with the communities along U.S. Highway 281 to make sure we are ready to be the first to make the most of this new technology,” said Hidalgo County Judge J.D. Salinas III. See story later in this posting. Lack’s Furniture has created a $10,000 scholarship fund through South Texas College to provide opportunities for the dependants of Lack’s employees to attend college. The company was originally founded in 1935 by Sam Lack, a Russian immigrant. The operations focused on selling automotive parts, but World War II pushed the boundaries of Lack’s into the home furnishings arena. Today, the business is still family-operated under the leadership of Lee Aaronson. A tradition of giving runs in the Aaronson family, which still owns the chain of 11 Lack’s stores serving the Rio Grande Valley from Laredo to Port Isabel. Featured, from left; Michelle Moffitt, buyer’s assistant for Lack’s; John Price, director of human resources for Lack’s; Al Moffitt, general manager for Lack’s; Kris Karr, advertising manager for Lack’s; and Anabel Hudson, buyer’s assistant for Lack’s. See story later in this posting. 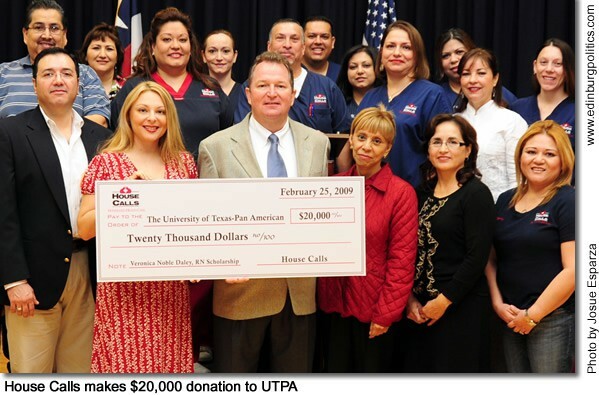 House Calls, one of South Texas’ largest home-based health care agencies, along with their employees and various community donors, have donated $20,000 to The University of Texas-Pan American to establish the Veronica Noble-Daley, R.N. Scholarship endowment. Noble-Daley graduated from UT Pan American in 1991 and became a registered nurse. She was only 25 years old when she decided to open House Calls and fulfill her desire to care for the sick and promote education, something she considered very important. Many times she assisted her employees in completing or furthering their education by providing them with flexible hours and tuition reimbursement. In addition, she helped support organizations and events that promoted education, such as the Florence Nightingale Gala, an event aimed at raising money for the university’s Department of Nursing. The endowment will benefit students pursuing a registered nursing degree and who are classified as entering freshmen, continuing freshmen, sophomores, juniors or seniors. Other requirements for the scholarship include maintaining a 3.2 grade point average, and residency in one of four Rio Grande Valley counties. Surrounded by House Calls employees, holding the check, from left, are: Armando Garza, House Calls marketing director; Erika Nobel, sister of Veronica Daley; Michael Daley, husband of Veronica Daley; Ruth Nobel, mother of Veronica Daley; and Lydia P. Alemán, associate vice president for University Advancement. 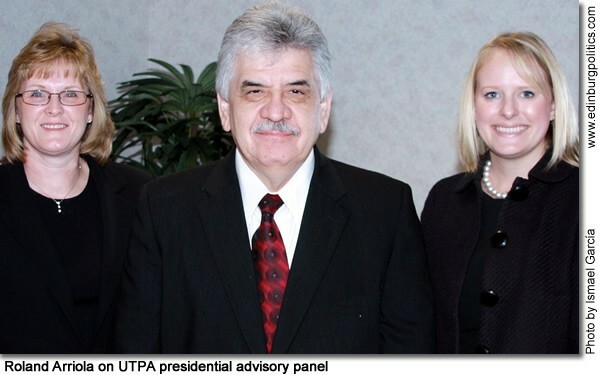 For information on supporting the advancement of UTPA, call the Division of University Advancement at 956/318-5301. 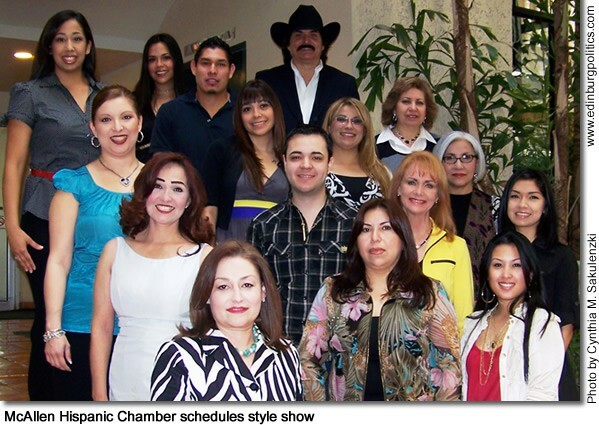 The McAllen Hispanic Chamber of Commerce has scheduled a "Spring Luncheon and Style Show" at the Embassy Suites in McAllen on Saturday, April 25, from 11 a.m. to 2 p.m. Casual, business, western and formal wear will be modeled by local community leaders and professional models. "The luncheon and style show allows our members, future members and the community to enjoy viewing the latest fashions as well as helping to stimulate our economy in McAllen and the Rio Grande Valley," said Verónica Vela, MHCC Vice Chair of Women’s Issues. A Spring Mercado consisting of individuals and/or stores will also be selling their wares and services in the hallway. Spring jewelry, crafts, purses, dietary supplements, etc. are just some of the items. The Mercado is free to the public. There are still some Mercado booths for sale. For more information on the Spring Mercado and/or the Spring Luncheon & Style Show call the MHCC at 928-0060. Featured are representatives of the stores that will be participating in the Style Show: Maclyn Flynn and Becky Cuellar of Warehouse 503; Becky Malcik of Beck’s Fashions; Alicia Suárez and Jessica Rangel of JCPenny’s Hair salon; Raúl Traigo of GUESS; Ana Delgado of GUESS by Mariano; Alejandro J. Garza of Kalifa’s Western Wear; Gloria Muñoz of Cute Cotton Co.; Carmen Esparaza of Joyce’s International Boutique; Mónica de Coss of Room Clothing; and Tony Lucio of Banana Republic. Committee members shown are: Verónica Vela, Vice Chair of Women’s Issues; Zaira García; Elizabeth Martínez, Vice Chair of Public Relations; and Orie Salinas, Vice Chair of Events. Participating stores not shown are: Spa La Posada, Our Secret, Dillards, Boot Jack, Nicole’s Boutique and Renée’s. Edinburg City Councilmember Augustín "Gus" García, featured left, makes a point during the Wednesday, March 4 public meeting of the Edinburg Community Health/Medical Care Advisory Committee, whose members received an update on the activities and goals of the Regional Academic Health Center in Edinburg. The $20 million facility – its official designation is the Regional Academic Health Center (E-RAHC), Medical Research Division for The University of Texas Health Science Center at San Antonio – is capable of expanding in order to provide the first two years of a UT medical school, according to Sen. Juan "Chuy" Hinojosa, D-McAllen. Dr. Thomas J. Slaga, Ph.D., featured right, a world-renowned biomedical scientist, a Professor of Pharmacology, and the interim director of the Edinburg biomedical research campus, provided the group with a tour of the state-of-the-art facility. Also featured, center, is Gilbert Mercado, III, another member of the city medical advisory group. See lead story in this posting. 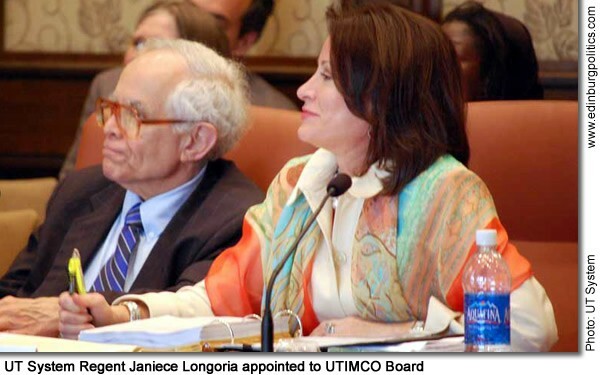 The University of Texas System Board of Regents on Tuesday, March 10, appointed Regent Janiece Longoria, formerly of Pharr, to the Board of Directors of The University of Texas Investment Management Company (UTIMCO). 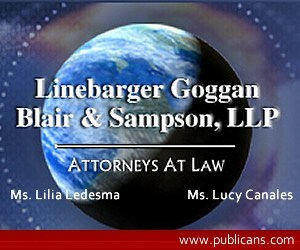 Longoria, a daughter of the late Sen. Raúl Longoria, D-Pharr, is a partner in a Houston law firm. She was appointed to the UT System Board of Regents in 2008. She succeeds former regent and UTIMCO board member Robert B. Rowling, who resigned last month. UTIMCO is a 501(c)(3) investment management corporation whose sole purpose is the management of investment assets under the fiduciary care of the Board of Regents of The University of Texas System. Created in March 1996, UTIMCO is the first external investment corporation formed by a public university system in the nation. It invests endowment and operating funds in excess of $18 billion. UTIMCO is governed by a nine-member Board of Directors. The UTIMCO Board of Directors includes three members of The University of Texas System Board of Regents, one member selected from a list provided by The Texas A&M University System Board of Regents, the Chancellor of The University of Texas System, and four outside investment professionals appointed by the UT System Board of Regents. Sales for the premiere of The Red Queen are going very briskly, according to the film’s writer-director David Carren. "With time to spare before its performance at 5 p.m. and 7 p.m. on Sunday, March 22, tickets are going very well." Tickets for the charity showing of UTPA’s Summer Workshop Film were being sold at the Box Office of University Theatre Productions. "We were out of our stack of tickets by Thursday, March 12," Theatre Manager Elva Galván stated. "Carmike in Edinburg still has them. The management will open two theatres for each of the two showings if the demand is great enough." The special showing is a benefit, arranged by Carmike of Edinburg, for two non-profit organizations, the Children’s Miracle Network and the theatre television film unit of The University of Texas Pan American Communication Department. Carmike is located on Canton Road just west of Highway 281. The University Theatre Productions Office will be open at least part of each day during spring break. 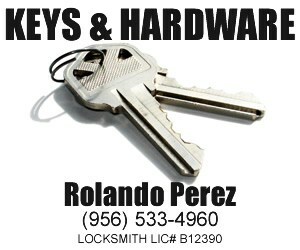 If anyone wishes to contact the office, they may call 956/381-3581 and leave a telephone number or an e mail address. Their questions will be answered as soon as possible. The Red Queen is an action-adventure film, approximately 110 minutes long. Suitable for family viewing, it is the story of a college student who goes on the internet to research her family background. She meets adventure, excitement and the Red Queen. See story later in this posting. 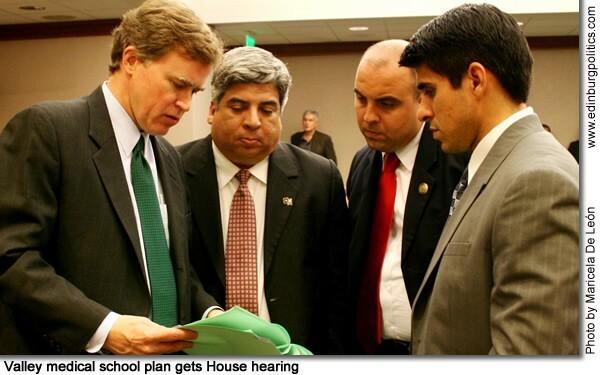 Rep. Aaron Peña, D-Edinburg, featured second from left, on Wednesday, March 4, presented legislation that would create a medical school in the Rio Grande Valley. 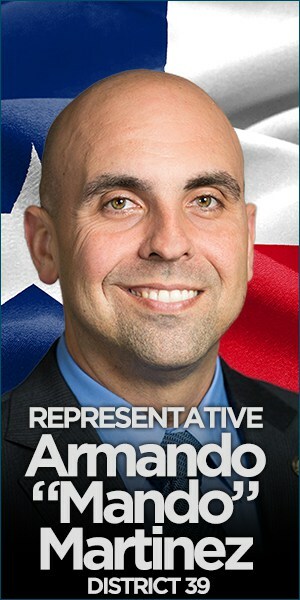 His measure, along with similar, but separate plans by Rep. Armando "Mando" Martínez, D-Weslaco, and Rep. Eddie Lucio, III, D-San Benito, were considered by the House Committee on Higher Education. Peña’s measure, House Bill 110, would transform the Regional Academic Health Center, located in Edinburg and Harlingen, into a stand-alone, four-year medical school and health science center. The key legislative panel, which has no Valley lawmakers, heard testimony in support of the medical school idea, but no vote was taken. Featured during a break during the panel hearing to review the legislation are, from left: Rep. Dan Branch, R-Dallas, chair of the House Higher Education Committee; Peña; Martínez; and Lucio, III. See story later in this posting. 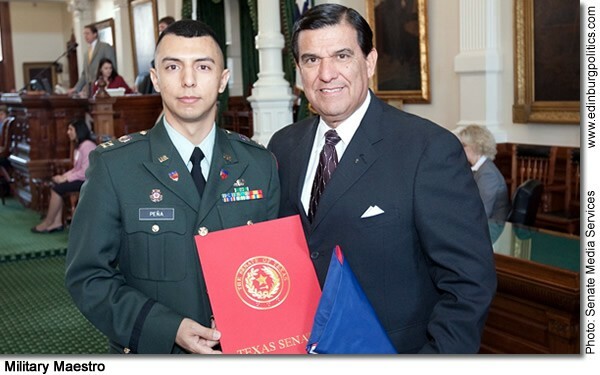 Sen. Eddie Lucio Jr., D-Brownsville, presents a Texas flag to Edinburg native Captain Leonel A. Peña after honoring him on Tuesday, March 3, with a Senate resolution on the Senate floor at the Texas Capitol. Peña is the youngest person and first and only Hispanic to become conductor for the United States Army Band program. 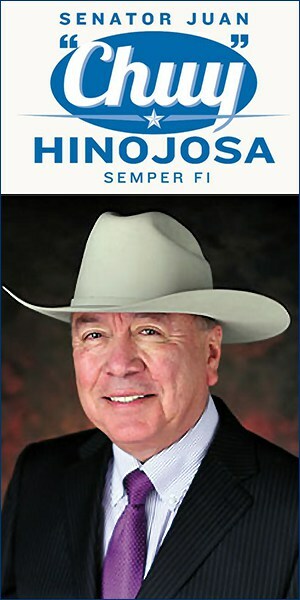 Sen. Juan "Chuy" Hinojosa, D-McAllen, not featured in this portrait, also was a co-author of the Senate resolution. See story later in this posting. More than 200 educators from across the Rio Grande Valley, Texas and the nation gathered in early March to discuss methods to accelerate students through the education pipeline and into the workforce. 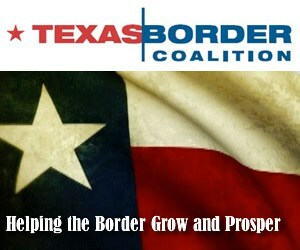 Hosted by South Texas College, 2009 marks the fourth year for the event. During the day-long summit, attendees looked at student access and success through a variety of lenses, including issues related to the Latino student population, issues faced by migrant and impoverished students, and how technology and the global marketplace have changed the education pipeline. 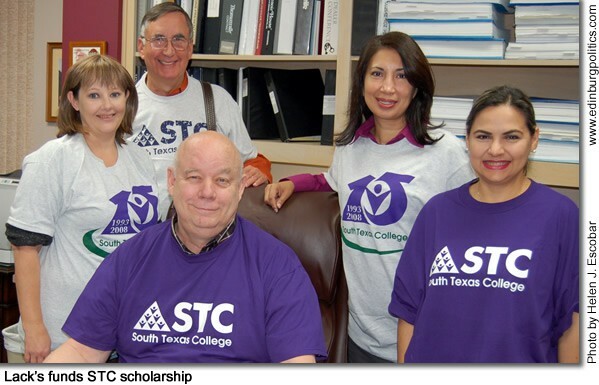 Featured, from left: Pricilla Hinojosa, MISD project manager for STC; STC President Shirley A. Reed; and Jessica Ray Rincones, a student in STC’s MCCTI Program with her parents Nancy and Ruben Rincones. See story later in this posting. An intriguing list of presenters, events and activities will delight the community – young and old – at the third annual Festival of International Books and Arts (FESTIBA) scheduled for March 22-28 at The University of Texas-Pan American. 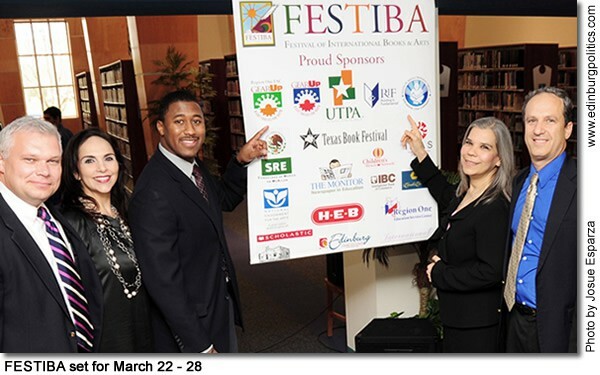 FESTIBA is a weeklong celebration of the arts and humanities and promotes literacy and cultural awareness by providing students and the Rio Grande Valley community interactive, hands-on opportunities to experience books, theatre, storytelling, music, art, dance, and performance competitions. Participants in a February 20 press conference to announce FESTIBA 2009 activities were, from left: Dr. Peter Dabrowski, associate director, UTPA Department of Music and Dance; Laura Hinojosa, Hidalgo County Clerk and president of the South Texas Literacy Coalition; Stephen Leach, director of Government Relations and Community Outreach, Reading is Fundamental; Dr. Dahlia Guerra, UTPA dean of the College of Arts and Humanities and FESTIBA coordinator; and Dr. Steven Schneider, UTPA English professor, director of New Programs and Special Projects in the College of Arts and Humanities and Big Read project director. Mayor Joe Ochoa, who earlier this year announced he would not be seeking reelection in May, on Tuesday, February 10, was honored by the Texas House of Representatives for leading Edinburg through an unprecedented period of economic development and improvements in the quality-of-life during his 13 years as one of South Texas’ most effective political leaders. The high praise was contained in House Concurrent Resolution 39, authored by Rep. Verónica Gonzáles, D-McAllen, whose House District 41 includes southwest Edinburg. The measure, which was approved unanimously by the 150-member House of Representatives, was publicly endorsed by Rep. Aaron Peña, D-Edinburg, whose House District 40 includes most of the three-time All-America City. 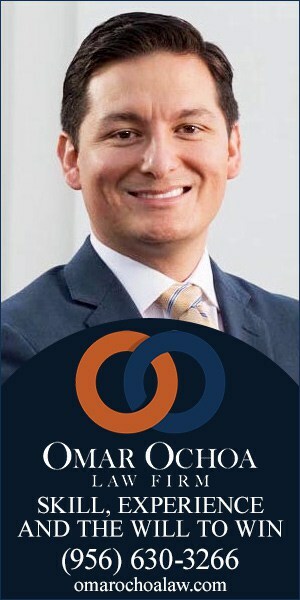 Ochoa was credited for heavily influencing the city’s "dramatic growth and prosperity," noting that during his tenure as mayor, Edinburg has seen the number of all properties in Edinburg increase dramatically, from $500 million in assessed valuations when he first took office in 1993, to $3 billion today. See story later in this posting. Roland Arriola, Ph.D., president of the Texas Valley Communities Foundation, was one of 15 members appointed on Monday, February 16, by the University of Texas System Board of Regents to serve on a presidential search committee to advise regents on the selection of a president for UT-Pan American. 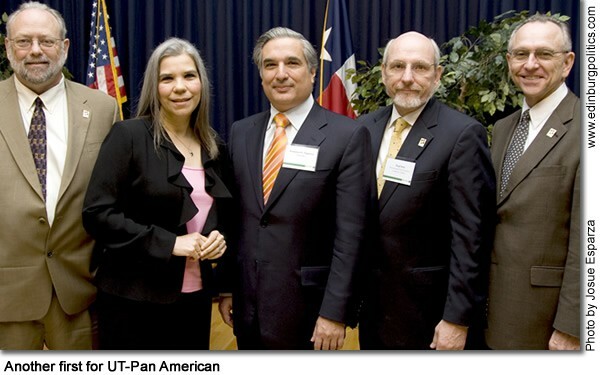 Arriola, a former member of the Edinburg Economic Development Corporation, was selected because of his role as president of the UT-Pan American Alumni Association. The UT System appointed Charles A. Sorber as interim president last month. Sorber assumed the interim presidency on Monday, February 16. 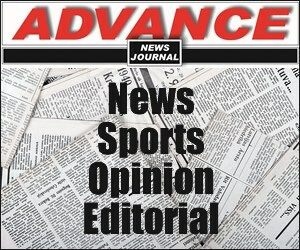 The advisory committee will be asked to present the names of no more than 10 candidates – unranked – to the board, which will make the final decision. Featured, from left, during a major conference in Harlingen last fall, are Kelli Rod, Vice President of Community Relations with TXU Energy; Arriola; and Courtney P. Suhr, Senior Strategic Communications Specialist with the OneStar Foundation. See story on the presidential advisory panel later in this posting. Sen. Eddie Lucio, Jr., D-Brownsville, featured left, and Sen. Juan "Chuy" Hinojosa, D-McAllen, featured right, on Tuesday, February 10, presented a Senate Resolution to members of Amigos Del Valle celebrating Senior Day at the State Capitol. Lucio paid tribute to the organization’s 2008-2009 King Luis Barrientos and Queen Eva Martínez, featured center, both representing Casa Del Mar in Brownsville. 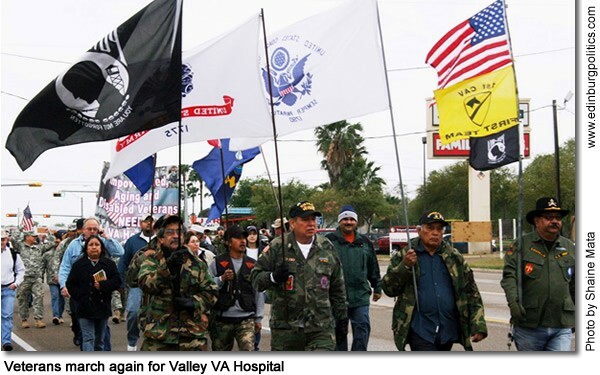 The 2007-2008 and 2008-2009 Royal Courts were also honored and included members from senior centers throughout the Rio Grande Valley. Amigos Del Valle is a consortium of county and city governmental entities working to provide nutrition, transportation and housing services to senior citizens of Cameron, Hidalgo and Willacy counties. Helping senior citizens live healthy, productive and self-sufficient lives is the group’s primary goal. 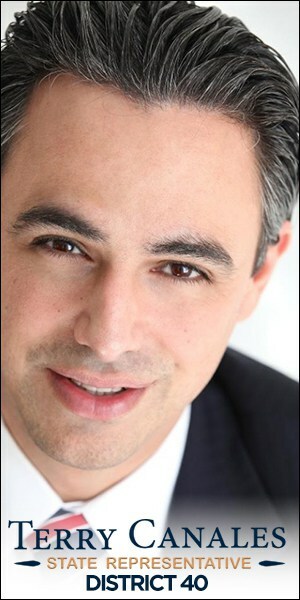 The Executive Director of Amigos Del Valle, Inc., located in Mission, is José Garza. 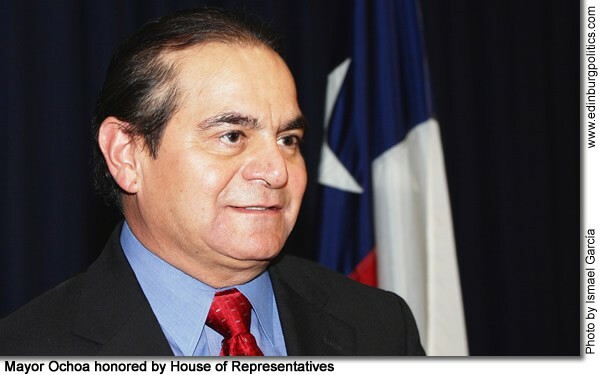 Former Rep. Roberto Gutiérrez, D-McAllen, is back in action at the Texas Capitol, working on key measures designed to help millions of Texans. But he is not a registered lobbyist nor a state lawmaker. Instead of providing public service in either of those two influential roles, he is serving the state as a member of the nation’s most powerful political entity – the American citizen. 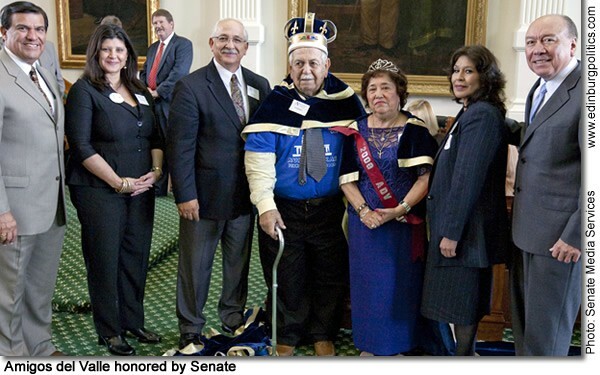 In that role, Gutiérrez and his wife, Cecilia, along with Delia Oropez of Weslaco and Estella Lane Treviño of Edinburg, are members of the Texas Silver-Haired Legislature, a powerful coalition of influential Texans who work on measures to help older residents. 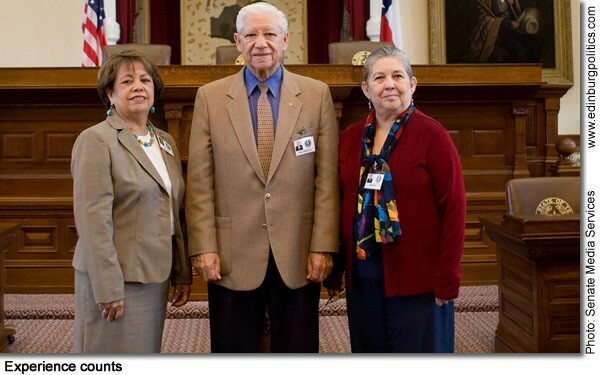 Featured in this portrait taken in the chamber of the House of Representatives are, from left: Delia Oropez; former Rep. Gutiérrez; and Cecilia Gutiérrez. See story later in this posting. Congratulations to Maureen F. McClain, associate director of Disability Services at The University of Texas-Pan American, who was recently appointed by Texas Gov. Rick Perry to the Governor’s Committee on People with Disabilities. 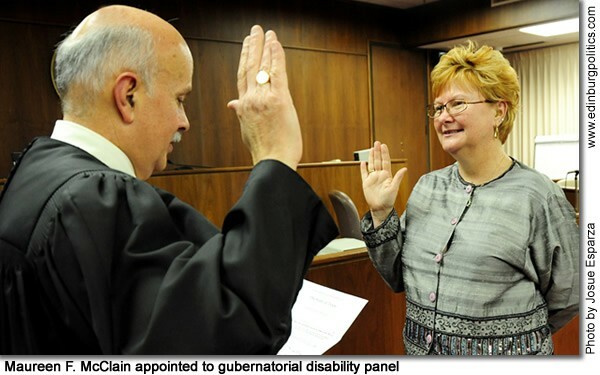 McClain was one of five individuals in the state, whose terms will expire February 1, 2010, to be chosen for the committee that works to ensure Texans with disabilities may live their lives with integrity, independence and productivity. Pictured is McClain being sworn in by U.S. District Judge Ricardo Hinojosa in late January in McAllen to the Governor’s Committee on People with Disabilities. McClain, who has been employed with UTPA for more three years, earned her bachelor’s degree in rehabilitative services and a master’s in rehabilitative counseling from UTPA. She is a member of the Association of Higher Education and Disabilities, and was appointed to the Academic Advisement Council. To learn more about UTPA’s Disability Services department and the services offered, visit http://www.utpa.edu/disability or for more information on the committee, visit http://www.governor.state.tx.us/disabilities/. Criminals don’t take a day off and they are always on at the top of their games. So why shouldn’t the rest of society be just as prepared to trump their aces, especially when it comes to cyber security? That’s why South Texas College is hosting a Cyber Security Workshop on Thursday, February 19 and Friday, February 20 at its Pecan Campus in McAllen. Offered in conjunction with Texas A&M University, the National Science Foundation and TEEX, the free workshop offers business owners and technology professionals the latest information about cyber terrorism and cyber security issues. 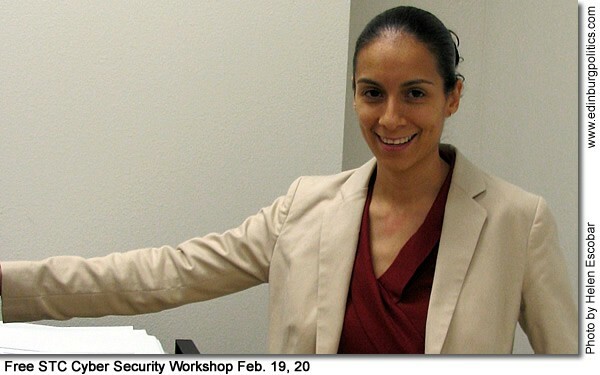 “We are very excited to host this workshop because the developments in technology occurring every day mean that we must be extremely vigilant in learning about the lat est innovations and how criminals are using them to try and damage our identities,” said Raquel Peña, assistant professor of computer science for STC, featured in this photograph. “But we don’t have to be victims, as long as we stay ahead of the curve and use the tools available to keep the cyber world safe.” Space for the workshop is limited to 80 participants and is filling up quickly. For more information or to reserve a spot, call 956/872-2056. Several South Texas College students had the unique opportunity to meet recently with Texas lawmakers in Austin to share their views about higher education, as well as their hopes for current and future generations of Hidalgo and Starr county students. Karina Cerda, Darien Fernández, Miguel García, Lizette Muñoz, Cassandra Orozco, Ronald Tanamachi and Esther Ybarra, who are members of STC’s Student Government Association, represented the student body at Community College Day at the Texas State Capitol on Wednesday, February 4. 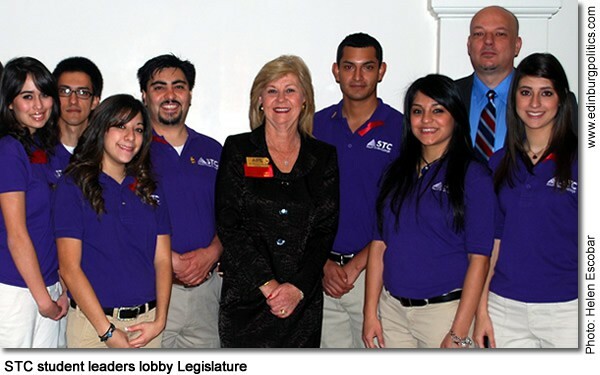 Community College Day was sponsored and organized by the Texas Junior College Student Government Association. The students toured the capitol building, attended a rally and had the opportunity to network with students from across the state. The STC students, who were chaperoned by a delegation of STC administrators, met with: Sen. Judith Zaffirini, D-Laredo; Rep. Ismael "Kino" Flores, D-Palmview; Rep. Verónica Gonzáles; Rep. Ryan Guillen, D-Roma; Rep. Lois Kolkhorst, R-Brenham; Sen. Royce West, D-Dallas; and Rep. Fred Brown, R-Bryan. The meetings allowed students to share their experiences and expectations with lawmakers to help them understand the continually growing role community colleges play in the economic growth and vitality of the districts they serve. In a related matter, STC leaders have announced that enrollment at the two-county higher education institution approached 22,000 for the spring 2009 semester. 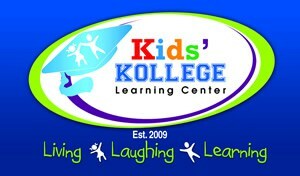 See story on enrollment later in this posting. The Edinburg Chamber of Commerce is going on a “SAFARI” from Thursday, February 26 through Sunday, March 1, at the Edinburg Municipal Park. The Heart of America Carnival will be featured during that week; with a $5 "All-You-Can-Ride" special on February 26. Musical headliners “Little Rob” will perform Friday evening and “DUELO” will perform on Saturday at 7 p.m. Fiesta Edinburg will also feature food, carnival, various music and entertainment. Also, check out the free “SAFARI” Kidz Zone on Saturday from noon to 6 p.m. ($5 parking fee required). Edinburg residents also will be treated to the IBC Bank Fiesta Edinburg “SAFARI” Parade, scheduled for Saturday, February 28, beginning at 10 a.m. The parade will start at the Hidalgo County Court House. Dedicated IBC Bank employees, as part of the IBC Employee Advisory Board, have contributed to making Fiesta Edinburg a great success for the community, noted Dina Araguz, Edinburg 107 IBC Bank branch manager. For more information on Fiesta Edinburg, please call 956/383-4974. Featured, from left: Enrique García, Salvador Martínez, Josue Ramírez, Aaron Ramírez, Judith Cantú, Dina Araguz, Lizette Cano, Ashley Herrera, Griselda Zambrano, Aaron Galván , and Robert Alaniz. 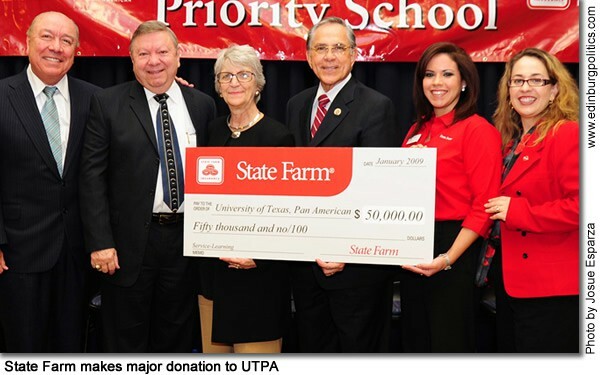 State Farm Insurance Company on Thursday, January 29, awarded $50,000 to The University of Texas-Pan American toward a project to promote service learning and safety awareness among South Texas educators and students. The twofold initiative, titled Project SELS (Service Learning and Safety), will incorporate workshops and other communication tools to engage more faculty, teachers and students in service learning activities related to their studied disciplines as well as opportunities for State Farm agents to promote safety awareness practices to create safer neighborhoods in South Texas. 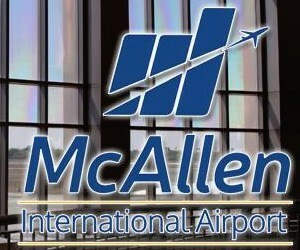 Area lawmakers, company officials, and university leaders were joined by Congressman Rubén Hinojosa, D-Mercedes, and Sen. Juan “Chuy” Hinojosa, D-McAllen, during a press conference to announce the grant award. Featured, from left: Sen. Juan “Chuy” Hinojosa; James Langabeer, UTPA Vice President for Business Affairs; Janice Odom, UTPA Vice President for University Advancement; Congressman Rubén Hinojosa; Lyra Vela-Salazar, State Farm agent; and Amelia Folkes, State Farm public affairs specialist. 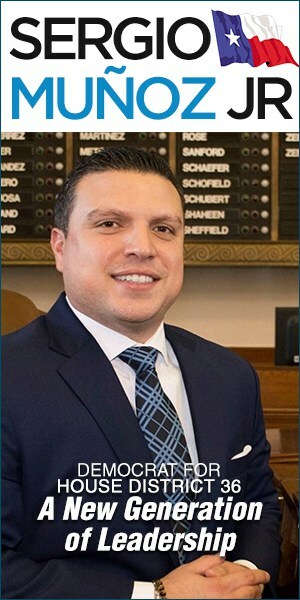 Community leaders from the City of Edinburg, including the majority of the Edinburg City Council, will be in Austin on Tuesday, February 10 to observe Edinburg Day at the Capitol, according to Rep. Aaron Peña, D-Edinburg, featured center. The group will participate in legislative meetings with state leaders, visit with key lawmakers, and receive a special recognition in the House and Senate chambers. "Edinburg has much to be proud of and I am honored to once again host my hometown at our state Capitol," said Peña. "I want to thank those city leaders who will travel to Austin to help make this day a great success. It is important that other legislators hear about the great things happening in our community." 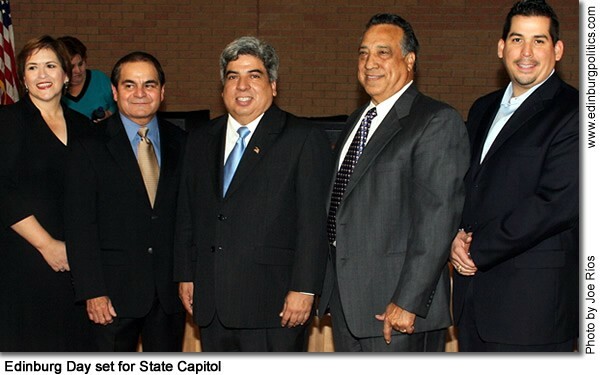 With Peña, during a gathering last fall at Edinburg City Hall are, from left: Councilmember Alma Garza; Mayor Joe Ochoa; Peña; Councilmember Noé Garza; and Councilmember Gus García. The four city officials are part of the delegation scheduled to travel to the Capitol. See story later in this posting. 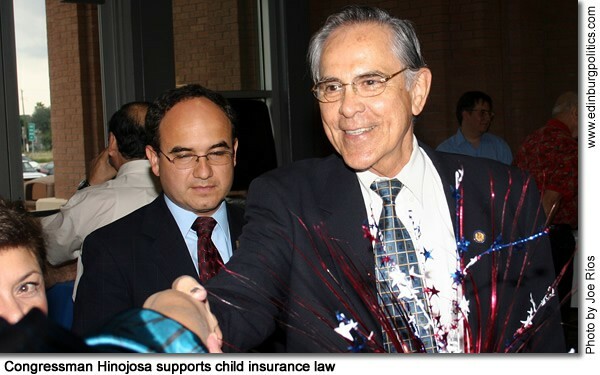 Rep. Rubén Hinojosa, D-Mercedes, featured during a reception in October at Edinburg City Hall, on Wednesday, February 4, voted to approve the final version of legislation that will provide health care to 11 million children in modest-income families. The bill was immediately sent to President Obama, who signed the legislation into law late that Wednesday afternoon. The State Children’s Health Insurance Program (SCHIP) Reauthorization Act becomes the second bill that President Obama has signed into law since he became President. "We have a duty as a nation to protect those who cannot protect themselves. This SCHIP legislation does just that by providing health care to millions of children whose families otherwise would not be able to afford private insurance,” Hinojosa said. “It is simply unacceptable that America continues to be the world’s only developed nation that does not provide health care coverage to all children.” See story later in this posting. 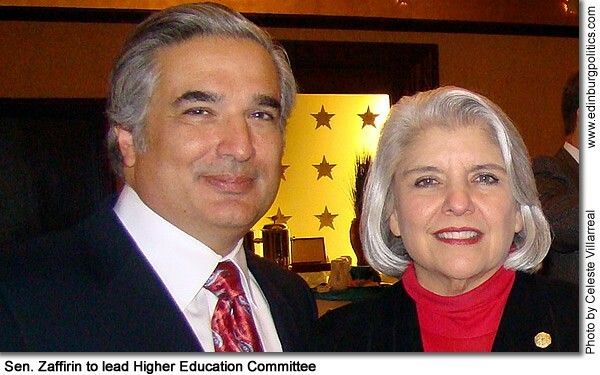 Sen. Judith Zaffirini, D-Laredo, featured here with Dr. Francisco Cigarroa, M.D., the new chancellor of the University of Texas System, was recently appointed chair of the Senate Higher Education Committee, which will have jurisdiction over many major issues facing public universities, medical schools, law schools, and community colleges in Texas. That and other Senate committee appointments were made on Friday, January 30, by Lt. Gov. David Dewhurst. He reappointed her to the Senate Finance, Health and Human Services, and Administration committees and to the upgraded Economic Development Committee. "Because higher education issues are so important and timely, Lt. Gov. 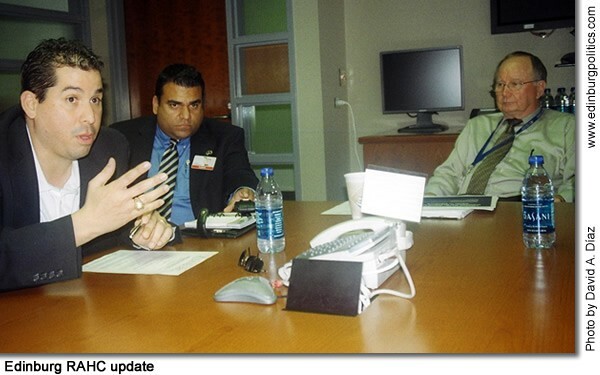 Dewhurst empowered us to address them more swiftly, efficiently, effectively and fairly," said Zaffirini. Her higher education committee will process legislation addressing pressing issues facing colleges and universities, including tuition deregulation, the top ten rule and the need for additional tier one universities. See story later in this posting.